The Brearley Field House is located at 353 East 87th St (between 1st and 2nd Ave). For directions to other athletic fields & locations, please visit our Athletics page. There are many ways to get to the School, which is located in the Gracie Point neighborhood near Carl Schurz Park. New families receive information in late spring about their daughter’s transportation options, including student Metrocards or free yellow bus service for those who meet eligibility requirements. In addition, parents may choose to carpool or take advantage of private van service, which is available for many areas. For those taking public transportation, two crosstown buses—on 79th Street and 86th Street—link Brearley to other bus and subway stops. The Lexington Avenue subway, for example, stops at 77th Street (local) and 86th Street (express). Throughout the year, a parents’ safety patrol route in the late afternoon adds an extra measure of oversight for older students commuting on their own. 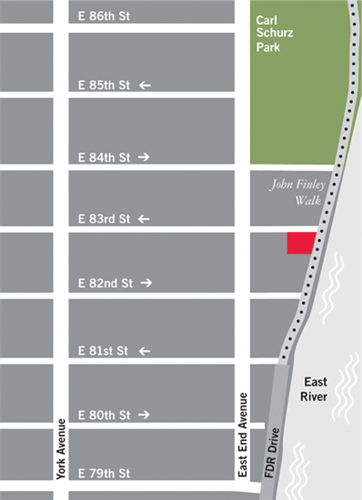 It is also simple to get here from the FDR Drive, with exits at 96th and 71st Streets (southbound) and at 61st and 96th Streets (northbound). There are several parking garages along 83rd Street, 82nd Street and East End Avenue.